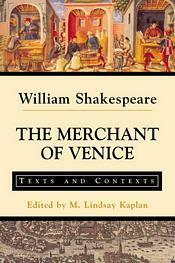 This edition of Shakespeare’s The Merchant of Venice reprints the Bevington edition of the play along with documents and illustrations thematically arranged to offer a richly textured understanding of early modern culture and Shakespeare’s work within that culture. The texts include maps, woodcuts, sermons, statutes, early modern documents reflecting Christian attitudes toward Jews and Jewish reactions to these attitudes, excerpts from the Bible on moneylending as well as contemporary discourses on usury and commerce, anti-Catholic tracts, travel accounts, diplomatic reports, scenes from a morality play about the corrupting effects of treatment of aliens, conduct literature, and contemporary treatises on the role of women. The documents illuminate religious controversy at the time of Shakespeare’s play, some of his sources, the place of Venice in the early modern English imagination, merchant culture, and marriage, sexuality, and friendship in the period. Editorial features designed to help readers relate the play to historical documents include an engaging general introduction, an introduction to each thematic group of documents, headnotes and glosses for the primary documents (presented in modern spelling), and an extensive bibliography.